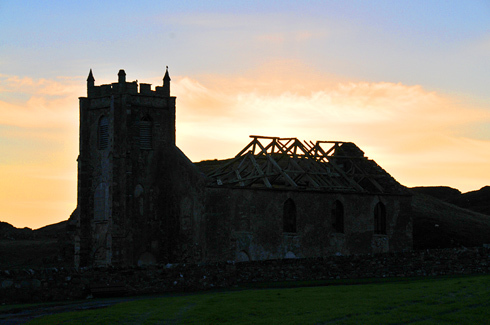 The few remaining roof trusses on the former Kilchoman Church were victim to the gale. The only "blessing" was that the timbers fell into the ruin of the church, rather than out onto the surrounding gravestones. This was on a nice morning in October 2010, it had looked like this for a number of years. I can't remember exactly when the ones on the left fell over, but it's certainly a good number of years. Now the remaining roof trusses on the right have fallen victim to the harsh weather on Islay's west coast as well. It will be something to get used to when I visit Islay again next April. As usual I will post a larger version of the picture on the Islay Pictures photoblog on Saturday morning, for those who would like to see it in bigger. For now it's Good Night and have a great weekend!